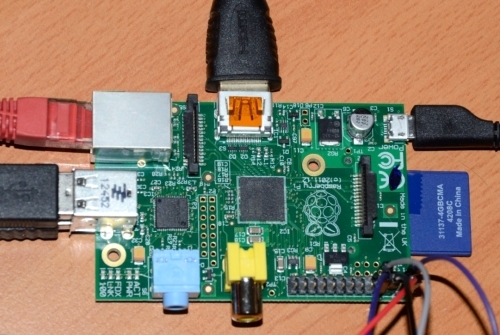 After we have created our first SD card, we can now boot our system on the Raspberry Pi. 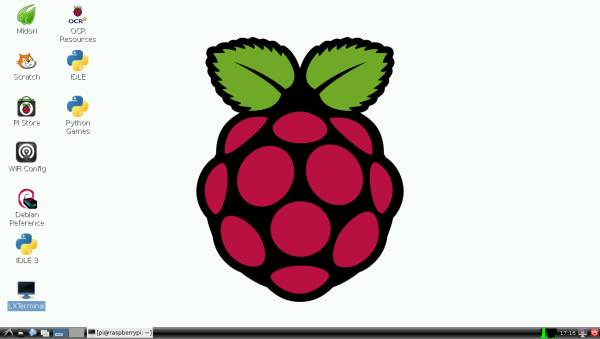 More information can be found on http://www.raspberrypi.org/quick-start-guide and http://www.raspberrypi.org/wp-content/uploads/2012/12/quick-start-guide-v1.1.pdf. http://raspberry-python.blogspot.ch/2012/09/day-0.html and continue to the next parts at the end of the ariticle. On the left side, we need to connect an USB mouse and an USB keyboard. The Ethernet cable for accessing the local network and the Web will be required to add more software from the Internet. On the top we see the HDMI cable connected to a display with HDMI capabilities. Finally on the left the micro USB cable to get the power for our device and our SD card coming from Preparing the SD card. We decided to use a 4 Gbytes SD card which is about twice the size of the original size, allowing us to have sufficient space for more applications and data. As soon as we boot the system, we should see the display active showing a huge number of progress messages indicating that the Kernel is booting. With ncurses, we cannot use the mouse but the cursor keys like up and down on the keyboard, as well as the return key. The left and right cursor keys allow to select the final <Ok> or <Cancel>. expand_rootfs to extend the system to fill the SD card. The extension will be done on the next reboot. configure_keyboard to set the keyboard. If we don't do it, we could have then surprises with characters like y, z, -, _, and other characters, if we don't have an Englisch keyboard. A number of varietes of keyboards, like the Generic 105-key and languages will be presented. For swiss French keyboard, we need to select first the German (Switzerkand). For the AltGr we can keep the default. No compose key too. We will allow tu use the Control+Alt+Backspace to stop the X server. change_pass can be done to change the installed user und password which are pi and raspberry. change_timezone is recommended to be on the right place on the planet earth! ssh is a must to be able to access the board later from the PC. We should se the message: SSH server enabled. boot_behavior allows to start the desktop environment and not in console mode. We should set it to Yes. We can stop the Raspi-config with the <Finish> selection and the return key. A "Would you like to reboot now?" ist presented and we should select agaib <Yes>. A a later stage, wenn the system has been already partialy setup, we could run again this configuration with sudo raspi-config.